A glockenspiel (German pronunciation: [ˈɡlɔkənˌʃpiːl] or [ˈɡlɔkŋ̍ˌʃpiːl], Glocken: bells and Spiel: play) is a percussion instrument composed of a set of tuned keys arranged in the fashion of the keyboard of a piano. 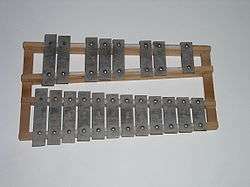 In this way, it is similar to the xylophone; however, the xylophone's bars are made of wood, while the glockenspiel's are metal plates or tubes, thus making it a metallophone. 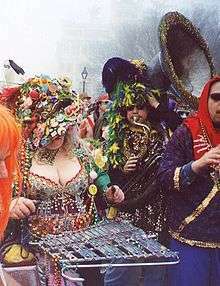 The glockenspiel, moreover, is usually smaller and higher in pitch. 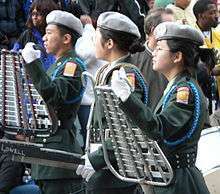 Glockenspiels are quite popular and appear in almost all genres of music ranging from hip-hop to jazz. Percussionist Neil Peart of the rock band Rush uses the glockenspiel in several of the band's arrangements, most notably in the commercial hit songs "The Spirit of Radio" and "Closer to the Heart", and also in album tracks "Xanadu" and "Circumstances". A keyboard-operated glockenspiel, as played by Danny Federici on such hit songs as "Born to Run" and "Hungry Heart", is considered part of Bruce Springsteen and the E Street Band's signature style. Jethro Tull drummer Barriemore Barlow used glockenspiel on many of Jethro Tull's classic albums Thick as a Brick, A Passion Play (namely on "The Hare Who Lost His Spectacles"), War Child (namely on "Skating Away On the Thin Ice of a New Day"), Minstrel in the Gallery (namely on "Baker St. Muse"), Too Old to Rock 'n' Roll: Too Young to Die!, Songs From the Wood, Heavy Horses and Stormwatch. Two well-known classical pieces that use the keyboard glockenspiel are Handel's Saul and Mozart's Die Zauberflöte, both of which originally used instruments constructed using bells rather than bars to produce their sound. (The part is sometimes performed on a celesta, however, which sounds quite different from the intended effect.) Solo glockenspiel can be heard briefly, but notably at the beginning of Shostakovich's 15th Symphony, and reappears in harmonic support with short interjections throughout the first movement (originally subtitled by the composer "The Toyshop," in part for its use of the toy-like instrument). A modern example of the glockenspiel can be heard in Steve Reich's 1970–71 composition Drumming, in which the glockenspiel plays a major role in the third and fourth movements. ↑ George Grove (ed. ), A Dictionary of Music and Musicians, 4 vols. (London: Macmillan and Co., 1878–1889). ↑ Cromelin, Richard, (19 April 2008). "E Street Band's keyboard player," Los Angeles Times. Retrieved 2 February 2014. ↑ Funk, Peter (19 January 2006). "Paul Duncan: Be Careful What You Call Home". PopMatters. Retrieved 2011-05-08. ↑ Cummings, Robert. "Dmitry Shostakovich – Symphony No. 15 in A major, Op. 141". AllMusic. Retrieved 18 July 2013. ↑ "The Vibraphone and Glockenspiel". All About Mallet Percussion. Archived from the original on July 6, 2010. Retrieved 28 May 2011. ↑ Campbell, Murray; Greated, Clive (1994). The Musician's Guide to Acoustics. Oxford: Oxford University Press. p. 436. ISBN 019159167X. Retrieved 12 October 2016. "Glockenspiel". Encyclopædia Britannica. 11 (11th ed.). 1911.